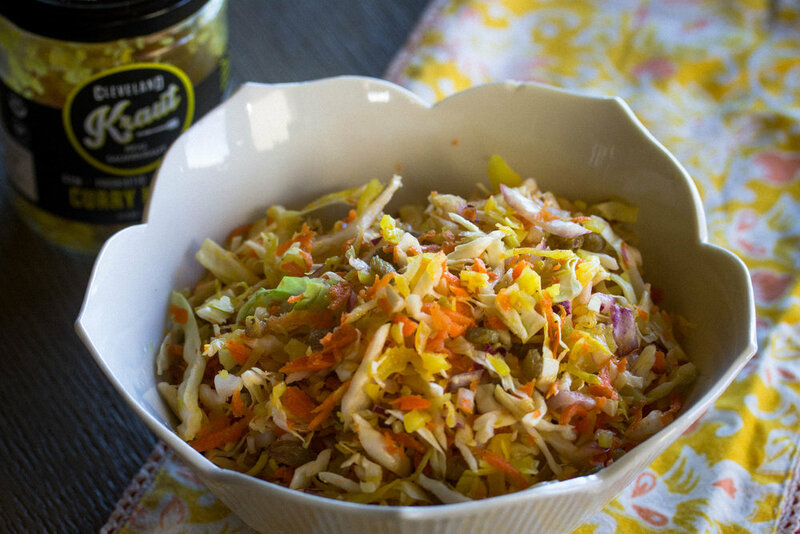 I am a huge fan of making kraut slaws, which essentially is sauerkraut mixed with other fix-ins to create a slaw that you can use in salads or tacos or even eat as is! Kraut is a great source of probiotics which help support gut health so it is extra important to make sure you are incorporating kraut into your daily routine. If you have trouble incorporating kraut into your meals, then these slaws are just for you! I have made a few others like my Fennel-Apple Kraut Slaw and my Cucumber Kraut Slaw that I love having on hand, I hope you all enjoy them as well! This recipe uses Curry Kraut from my friends at Cleveland Kraut, who make arguably some of the best kraut I've ever had! It is all small batch, hand crafted and unpasturized leaving you with a jar of gut healing deliciousness. Their various kraut recipes are incredibly fresh and crunchy so are super tasty to add to any meal! Combine all ingredients into a bowl and mix well!